Voluma is one of the newest dermal fillers available for non-surgical rejuvenation. It is part of the Juvéderm family of products, manufactured by Allergan, a trusted global leader in pharmaceuticals. Voluma is approved by the FDA for correction of age-related volume loss in the cheek area. How does volume loss in the midface affect your appearance, and what results can you expect from Voluma? 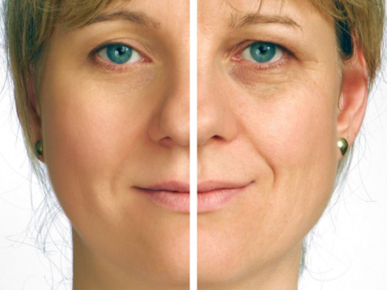 Dr. Douglas Blose shares this “before and after” Voluma insight to help patients in the Downey, Huntington Park, and Montebello areas take the first step toward a more youthful appearance. Voluma contains hyaluronic acid (HA) in a smooth gel base. Don’t let the word “acid” scare you. HA is a carbohydrate that occurs naturally in the human body. This amazing substance binds with and retains many times its own weight in water. Your body produces HA to maintain fluid content in the eye, and to lubricate joints. There are many HA dermal fillers on the market, but cross-linking sets Voluma apart. The Voluma formulation contains a three-dimensional network of HA polymer chains. That means that Voluma provides more lift that lasts longer than other fillers. This deep tissue filler is injected beneath the skin into the cheek area. While the number of syringes used depends on the amount of volume loss and your individual rejuvenation goals, usually only one injection session is necessary. There is no downtime – you may return to regular activities right after your appointment. While there can be slight redness or bruising at injection sites, it can be camouflaged with makeup and typically resolves quickly. So, how does volume loss in the midface affect your appearance, and what results can you expect from Voluma? As we age we lose volume in the form of fat, hydration, muscle, and even bone in the face. As the “apples” of the cheeks flatten, skin sags on the lower portion off the face. Voluma contours the cheeks for a more youthful profile, as it draws sagging skin upward with long-lasting lift. Results are immediate, and in clinical studies, patients reported looking up to five years younger. Cross-linking slows the process, but HA is eventually absorbed by the body, and meanwhile the aging process continues. The lift and smoothing effect of Voluma lasts, on average, two years. Most patients are so thrilled with their results that they are eager to schedule touch-up sessions to maintain the transformation. Voluma comes with an added layer of assurance – while it is rare, injections are completely reversible for the patient who is not satisfied. Call (562) 923-6450 to schedule a dermal filler consultation with Dr. Blose. He will be happy to describe a non-surgical treatment plan customized for your rejuvenation goals, and show actual before and after photos of Voluma patients. Downey, Whittier, Huntington Park, and Montebello, California residents trust their appearance and their health to Dr. Blose.